A widespread but localised species of ancient woodland and other places with old trees. 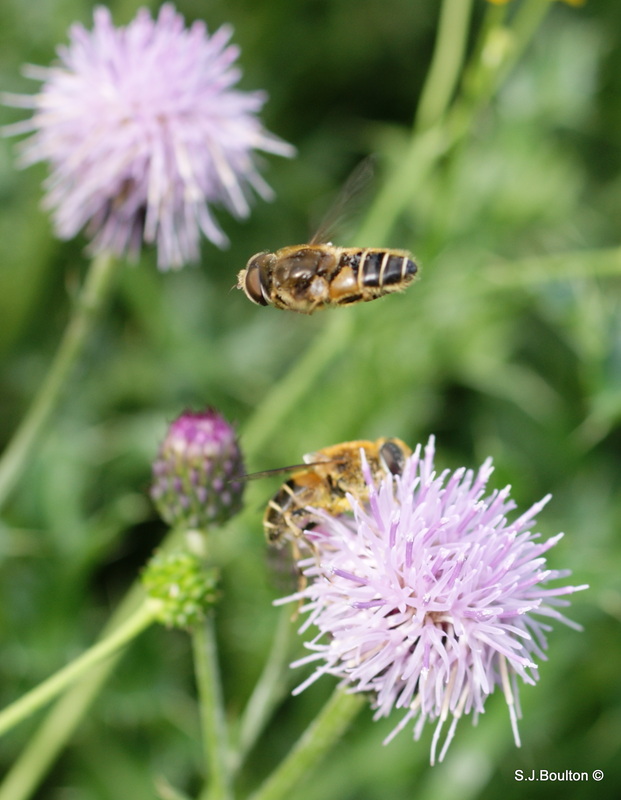 Two very different colour forms exist – the ‘type’ form with a white tail and broad yellow collar (a superb mimic of the Tree Bumblebee, Bombus hypnorum) and the all-yellow form ‘oxycanthae’ (a mimic of carder bumblebees like B. pascuorum). 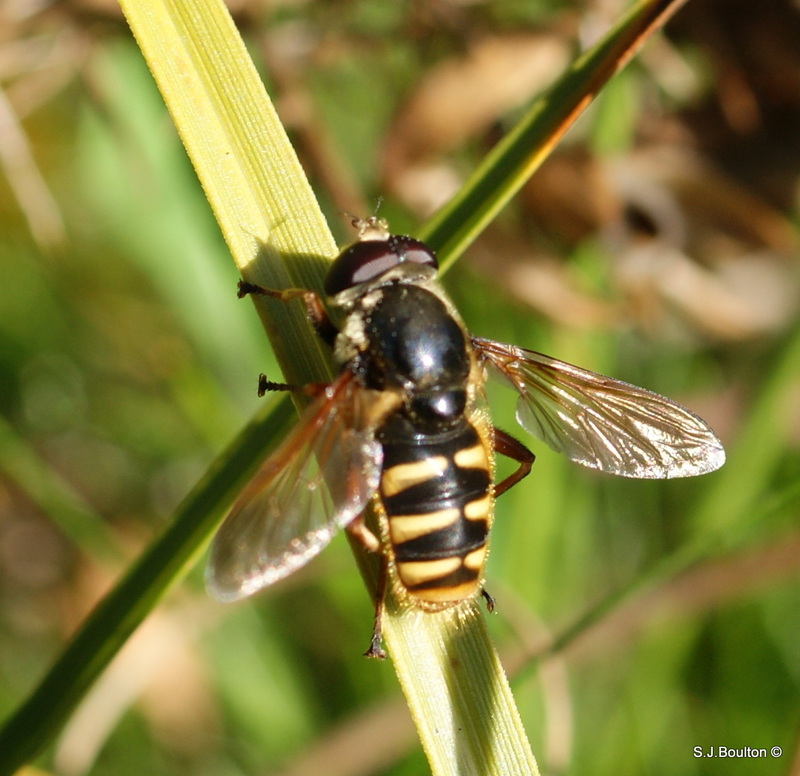 The latter is very similar to another hoverfly, the late-flying Arctophila superbiens. 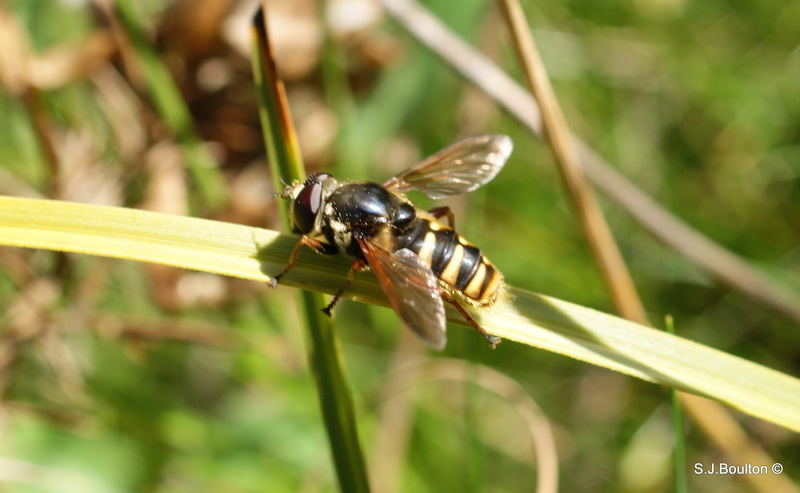 A new hoverfly for me a Meliscaeva auricollis. sorry about the poor quality photo but it was taken on my phone. Wing length 7.5 to 9.5 mm. Similar to the much more common R. campestris, but in Rhingia rostrata the thorax is more bluish in colour, there are no dark edges to the abdomen, the legs have more orange and less black and it is generally brighter in colour being yellowy orange rather than a duller brownish orange. 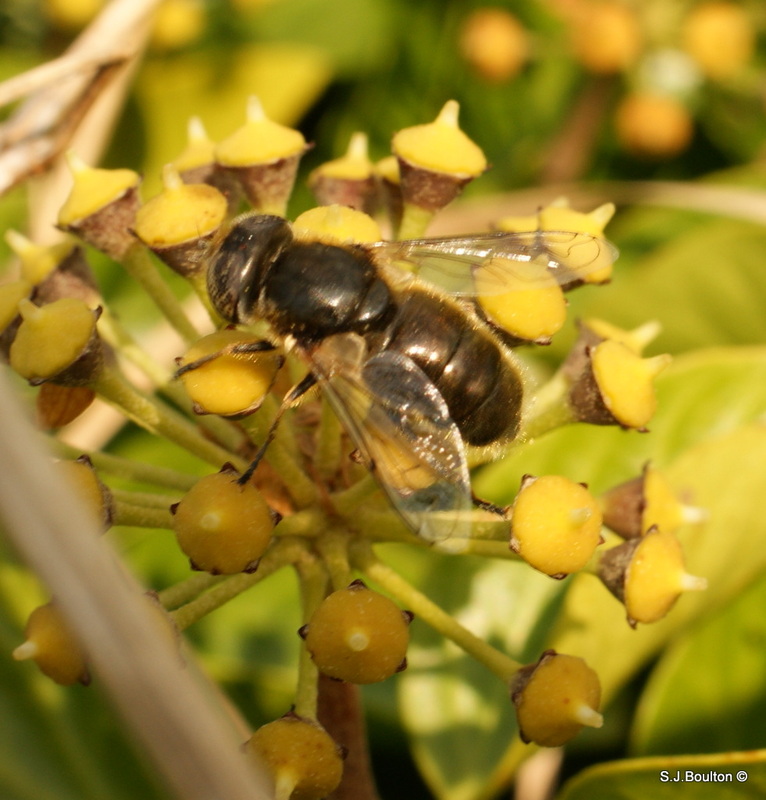 It seems to be found mainly in woodland (especially semi natural woodland). April to October peaking in August and early September. This species has undergone a major range expansion and is now widespread across the southern half of Britain to North Wales. 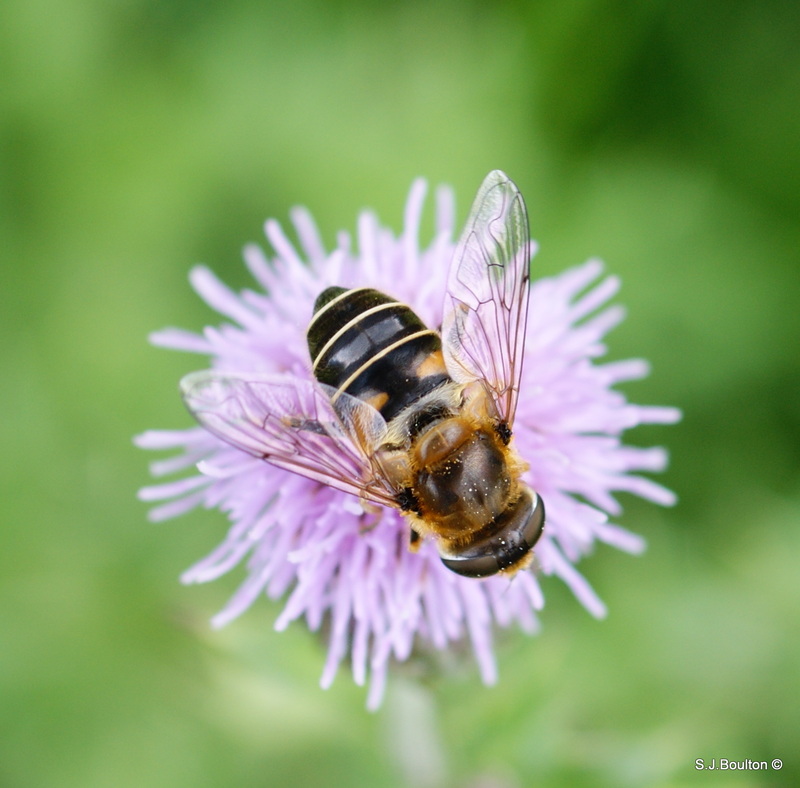 On general appearance, Eristalinus sepulchralis is immediately recognisable as being ‘different’ from similar, all black Hoverflies. It’s general stocky build, makes it distinctive as it visits a range of flowers. Found commonly over much of the UK. The abdomen is shiny black or bronze at the sides and it usually has pale thoracic stripes. Usually seen around ponds and in marshes where there is a large amount of decaying vegetation, or where cattle trampling and dung has resulted in enrichment. April to October but especially from June to August. The larvae are known to occur in decaying vegetation in ponds and in wet manure. Widespread in much of southern England at least and fairly common in suitable areas. 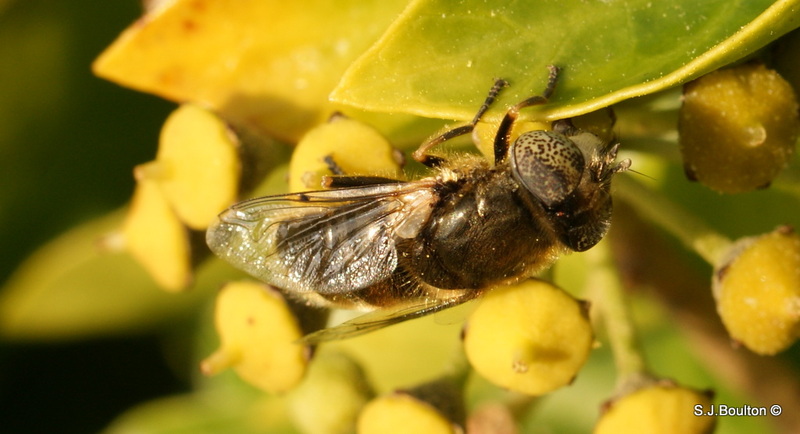 A small drone-fly and quite similar to E. arbustorum (the dwarf drone-fly). The small but crisp dark patch on the front edge of the wings (called a stigma) helps to identify this species. It also has a clean and relatively thin black stripe down its face. It can be found in a wide range of open habitats such as meadows, gardens and wasteland. It can be seen from April to October, peaking in July and August.